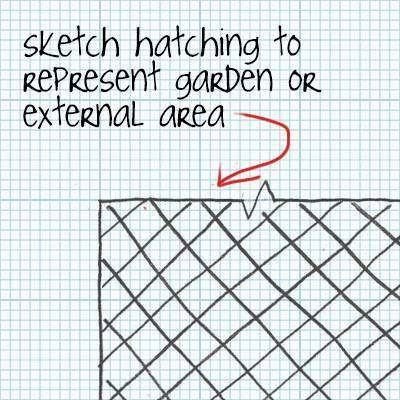 Everything you need to know about sketching your plan. It is always best to start in a corner of your graph paper. Using graph paper is advisable as it is easier to follow straight lines. Although it is not always vital that your sketch is perfectly in proportion it is recommended that you try to keep spaces in proportion relative to each other and use the scale provided. 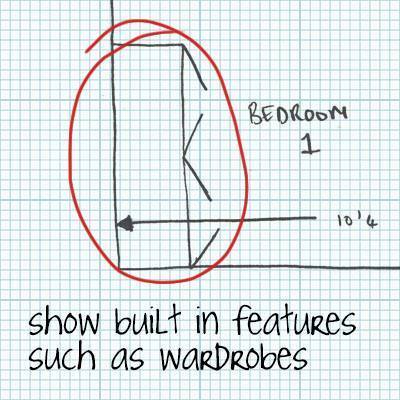 This way any discrepancies can be avoided by refering to the sketch and measurements rather than just one or the other. Use a nice sharp pencil or retractable pencil and always keep a rubber handy! Use a clipboard or a book to ensure your sketch is as neat as possible. If you intend on making a few plans it may be advisable to invest in a laser measuring device. If not then a measuring tape can be used. 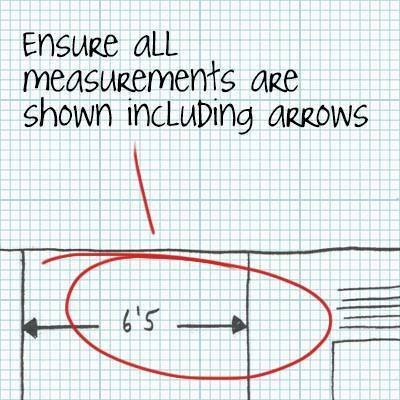 Remember to measure the widest parts of the room to gain its main dimensions. If the room is an irregular shape i.e is ‘L’ shaped or has a diagonal or rounded wall then it is advisable to take a few measurements and add these to your sketch. 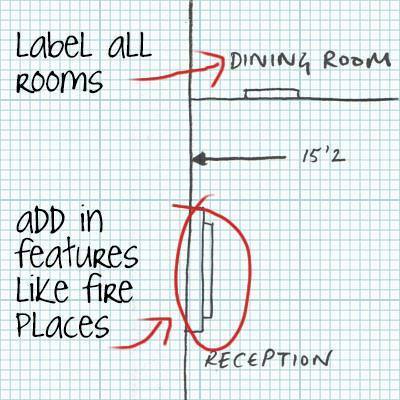 It may sound obvious but do remember to name rooms clearly and put all dimensions on your sketch. Generally measurements should be provided in feet and inches but your plan will be provided with both feet and meters. From our experience hallways will draw themselves. Not literally but if you correctly mark down all the rooms the spaces left should create these spaces which you can then simply block in. Hallways and stairs don’t necessarily need measurements unless they seem to be notably large spaces in which case feel free to add measurements. Firstly remember to name each floor! First floor, second floor etc. If you have a basement then please add this in too. Lay out floors as clearly as possible. In general floors can be fit on to the same page but if you need to use another page then do so. It is important that you add page numbers too. i.e. page 1/2 page 2/2 etc. Gardens can be quite large and we don’t expect you to draw to scale the whole thing. It is most important you draw the shape of the garden in relation to the immediate vicinity of the building. The rest can added stating ‘Garden extends to…’. Add zigzag markings to indicate that the whole garden is not drawn on. As always label these areas. Add hatching to them too to indicate that they are external areas. 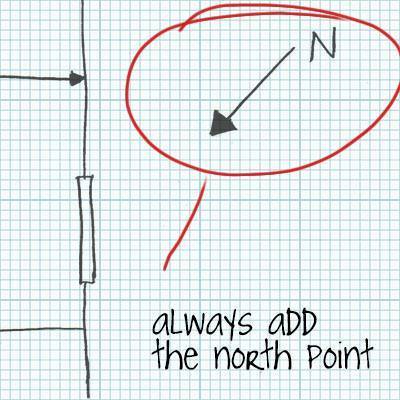 It is best to use a compass to draw on the an accurate north point. 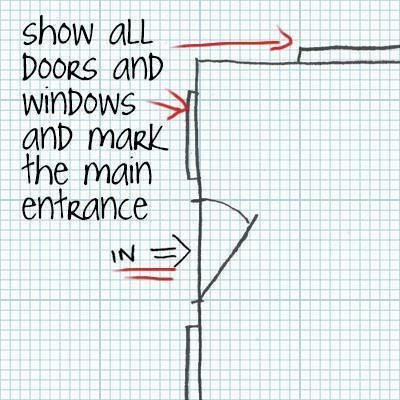 Place the compass on your sketch in line with the ‘IN’ (entrance). Position yourself so your sketch is facing the same way as your property. Mark down the north point. We can’t stress enough how important to check your plan for all the correct elements. If in doubt add more labelling than you need then we can decide what is necessary. Once your sketch is complete you will need to provide a good quality scan or photo. You can do this on a phone as long as it is completely clear and not too dark. If we can’t read it then, unfortunately, it will be rejected and you will need to resend. You will need to place an order with us first and then we will send you a notification email with the email address to send your sketch to. Within 36hrs we will provide you with your floor plan. That’s hopefully everything you need to know about sketching your plan, you can order above or click here.